Lost Fog Baie Creme – inspired by today’s top hybrid fusion chefs. A custom blended whipped honey cream, spiked with the essence of sweet passion fruit and topped with tart exotic berries Exclusively mixed in a HIGH VG base to produce only the softest, silkiest, smoothest clouds of pure vaping bliss. Prepare to lose yourself in a flavor nirvana. Lost Fog Baie Creme is an intense dessert and fruit flavor combination. On the inhale, you can immediately taste this incredible creamy goodness. On the exhale, the dessert flavors are enhanced with the sweet and exotic flavors of tart acai berries and passionfruit. In addition, all of these flavors are well picked and suit each other perfectly. Overall, any vape enthusiast who likes either dessert or fruit vape juice should get a hold of this beauty. 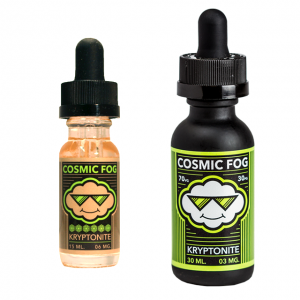 Lost Fog line is made by world-wide-known e-juice manufacturer Cosmic Fog.